Need some great baby shower recipes to satisfy your guests? One of the best parts of going to a baby shower is being able enjoy great food and good friends. Rather than spend all of your time looking for that perfect recipe, why not try one of ours? 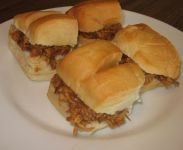 Below is a group of delicious and easy recipes that will work well for baby showers. 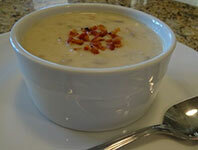 These recipes are all well-loved and contributed both by me and other guests to this website. They should get your baby shower off to a great start. Make sure to read the baby shower menu to see how to properly structure your meal for your guests! You can also share your favorite baby shower recipes with our website readers. Unroll and press flat on a 15-1/2 x 10-1/2 x 1 inch cookie sheet with a lip, sealing perforations. Bake at 350 degrees for 10 minutes. Mix. Spread over cooled crust. 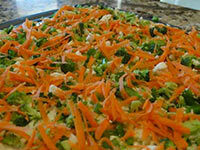 Top with finely chopped raw vegetables such as, Broccoli, Cauliflower, Carrots, Green Bell Pepper, Green Onion, Olives, or tomatoes. 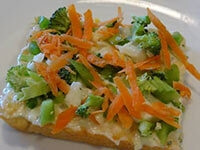 Press vegetable lightly into cream cheese. Top with grated Cheddar Cheese. Keep refrigerated until serving. Cut into 3-inch squares. Mix cream cheese, mayonnaise together in mixer. Blend until creamy. Add the rest of ingredients except croissants. Mix well. Cut a slit in the side of the croissant rolls. Stuff rolls with mixture. Toss chicken, celery, green onion, and grapes in a bowl. Add mayonnaise, lemon juice and cheese. Mix well. Add garlic salt and pepper to taste. Cut a slit into each croissant and stuff with mixture. Put almonds, sesame seeds, and broken up ramen pieces on a baking sheet and toast in a 350 degree oven for a few minutes stirring occasionally. 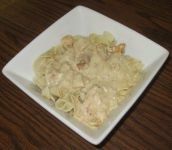 Mix together chicken, cabbage and onions in a bowl. Create dressing by combining sugar, vinegar, oil, salt, pepper and the flavor package from the ramen noodles. 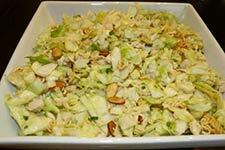 Toss salad with dressing and toasted almonds, sesame seeds and noodle mixture before serving. Place chicken in slow cooker and cover with other ingredients. Stir until coated well. Cook 3 to 4 hours on the high setting or 6 to 8 hours on the low setting. Shred chicken when cooked and continue to cook the remaining time in sauce. 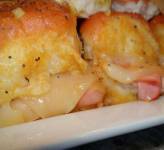 Serve on rolls or with baked potatoes. Melt butter in a pan. Add onion and saute. Remove from heat. Add mustard, Worcestershire sauce, brown sugar and mix well. Set aside. Preheat oven to 350 degrees. 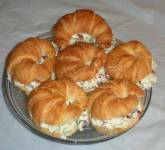 Cut dinner rolls in half and spread mayonnaise on both sides. 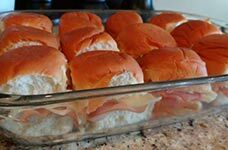 Place ham and Swiss cheese inside each roll and put all 12 rolls in a 9x13 pan. Be careful to not allow too big of gaps in between each roll so the sauce does not make the bottoms soggy when you pour it. 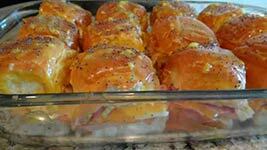 Pour sauce over rolls and sprinkle with poppy seeds. Cover pan with foil and bake in oven for 12 minutes or until Swiss cheese melts. Remove foil and bake for another 2-3 minutes add a crisp to the top of the rolls. Mix eggs, cornstarch, garlic salt and milk. Pour batter over chicken. Heat oil in frying pan. Use tongs to put chicken in a few at a time. Cook until brown. Put on a plate with paper towels when done. Set aside. In a medium saucepan, combine everything except the cornstarch and 2 tablespoons of water. Bring to a boil over medium-high heat. In a separate bowl, mix your cornstarch and water and stir to combine. Stir into the sauce. Reduce heat to medium low, and stir until sauce has thickened. Pour sauce over chicken and mix well. Serve over rice. Using a cutting board and pizza cutter; cut the tortillas in strips. Place on a baking sheet and coat with cooking spray. Sprinkle with salt. Cook in preheated oven set at 400 degrees until crisp. Watch careful because they can burn easily!! 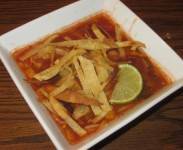 Serve soup in bowls with tortilla strips, cheese and extra slices of lime for garnishing. Preheat oven to 425 degrees F. In a large pan bring water, seasonings and butter to a rolling boil. Remove pan from heat and stir in flour until mixture forms a ball. Beat in eggs, one at a time, mixing well after each addition. Drop by tablespoonfuls onto ungreased baking sheet. Bake for 20 to 25 minutes in the preheated oven until golden brown. Drain salmon and debone. Mix well with the other ingredients. When shells are cool, cut a slit into the side and fill with filling. Place chicken, butter and Italian dressing mix in crock-pot. Cook for 4 hours on low or 2 hours on high. Add cream cheese and mix well. Cook for another 1/2 hour. Serve over noodles. 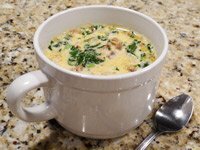 In a bowl, combine potato soup, Veg-All, chicken, milk, thyme, and pepper. 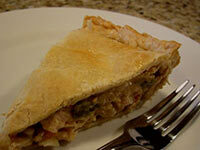 Put mixture in one pie crust. Cover with second pie crust. Crimp edges and slit the top of the pie. Beat an egg and brush on top pie crust. Bake at 375 degrees for 40 minutes. Let cool 10 minutes, serve. For individual servings, bake pie in ramekins or another small oven safe dish. Combine peeled potatoes, cubed, with chicken broth. Simmer 20 minutes or until potatoes are tender. Mash potatoes in broth. Cook bacon and crumble. Add to broth mixture. Cook mushrooms and onions in bacon fat. Cook until tender. Add mushrooms and onions to broth mixture. Add milk, cheese, salt and pepper. Cook until cream cheese melts, but do not boil. Cut chicken into little pieces and place in frying pan with the bell pepper, squash, onion and a little oil. Meanwhile, boil the pasta in a large pan. Cook chicken until no longer pink in center and vegetables are tender. Mix the noodles with the chicken mixture. Sprinkle with parmesan cheese, garlic salt and pepper until it is seasoned to your desire. Very quick to make and delicious! 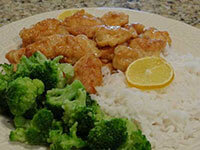 In a large skillet, cook breaded chicken tenders in oil until golden brown and cooked through. Place on a plate that has been covered with paper towels. Set aside. Meanwhile in a small pan, heat franks hot sauce with brown sugar and water. Cook until all the sugar has dissolved. Allow to cool. 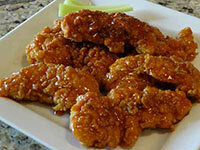 When you are ready to serve, mix chicken and sauce in a bowl until completely coated. Serve with ranch. In a large stockpot, cook bacon. Set cooked bacon on a plate covered with paper towels, to drain. Crumble and set aside. Drain grease from stockpot and add sausage and onions. Cook until meat is browned and onions are clear. Add garlic and cook for a minute before adding chicken broth. Add water, potatoes, salt, pepper and italian seasoning. Cover and simmer for 20 minutes. Add heavy cream, bacon and kale. Simmer for 5 minutes before serving. Enjoy!